In the first half of the match, Avatiu capitalized on a through ball from their mid fielder Atu Putere when striker Marcelo Rairoa latched onto the ball and sneaking it past Takuvaine’s goal keeper. Minutes later Takuvaine equalized through Murare John who found himself unmarked with only the goal keeper to beat and not wasting that opportunity scored Takuvaine’s first goal for the match. More football drama was to follow when Takuvaine’s Murare John extended their lead with their second goal when he kicked the ball over the Avatiu’s goal keeper catching him away from the goal mouth. However, Takuvaine’s lead was short lived when Avatiu’s Repaio Jones scored the equalizer before the half time break. The second spell of the match saw both sides trying tirelessly to extend their lead but both defences keeping their wall sturdy to deny any goals being scored. The match ending with a two all draw. Like their Premier Men, Avatiu and Takvuaine could only manage a two all draw in the CIPS Image & Copy Centre women’s championship last Saturday. Both sides were evenly matched throughout the full eighty minutes of play taking their opportunities as it presented itself however it was difficult to put those chances to the back of the net. In the other matches played in Tupapa hosts Tupapa and Arorangi, Tupapa controlled their match to end their game with six unanswered goals by the final whistle in the Lotto Premier Men’s competition. The CIPS Image & Copy Centre women’s championship match saw Tupapa draw against leaders Arorangi with a two all draw. 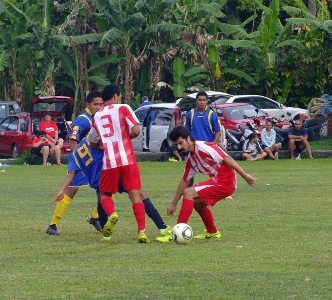 Friday’s games at the Nikao field, Nikao Sokattak beat Matavera by four goals to nil in the premier men’s match while in the senior women’s game Nikao winning their game by six goals to nil.